Metairie is a place often disparaged by those “not from here.” It is especially disparaged by those not from here who seek to cloak themselves and where they came from in all things New Orleans. By disparaging our hinterlands, they strive to make themselves all the more genuinely New Orleans. Ironically, these self-appointed New Orleans experts miss the “tout ensemble” for the trees (or maybe the lack thereof). They fail to discern that there is often more New Orleans buried amid the neon-and-concrete trappings of seemingly bland suburbia than in the city itself these days. Especially musically. Mo’s Chalet is just such an under-the-radar den of down-home blues. Impresario Morell “Mo” Crane is an important patron of local music, particularly the classic styles such as jazz, rhythm and blues, and swamp pop. Mo brought in his old friend, sax titan Sam Butera, years before the New Orleans JazzFest ever sat up and took notice that the supercharged turbine behind Louie Prima was still jumping, jiving, and wailing like never before, well into his 70s. And “the people,” in Mo’s case, fit a certain demographic. They are either members of “the Greatest Generation” or hail from the immediately younger age groups. These are the people who grew up in a still-vibrant New Orleans, attended its grammar and high schools, and bore witness to not only the jazz revival of the late 1940s and early ’50s, but also the birth of rock ‘n’ roll. These are the people who remember Butera and Prima blazing away on Bourbon Street and at the Beverly Club. These are the people who saw Pete Fountain and Al “Jumbo” Hirt trading lightning-bolt licks at Lenfant’s on the lakefront. These are the people who when they hear the name “Dukes of Dixieland” immediately think “Assunto brothers”—you know, those nice neighborhood Italian boys from around the French Market who just happen to have a red-hot family band. These are the people who grew up buying Fats Domino 45s and swaying to Jerry Raines’ “Our Teenage Love” at the CYO dances. They remember serving detention-hall stints with Roland “Stone” LeBlanc at Warren Easton High, or eating cheeseburgers next to a teenage Frankie Ford at Da Wabbit in Gretna after a sock hop at the McDonoghville VFW. These are New Orleans’ salt of the earth, and those who still make it out to Mo’s Chalet are the silver-fox survivors. They’re still boogieing down and drinking up well into their 60s, 70s, and 80s. One recent Sunday I stopped in to hear vocalist Duke Duplantis front his RBT combo. What a gentleman Duke is—a total man’s man, whose specialty is singing Sinatra and other Rat Pack standards with the perfect measure of gravitas and testosterone. I don’t know who I’d be more afraid to piss off backstage in Vegas in a fight over some mob bimbo: Duke himself, or Ole Blue Eyes backed up by a gang of sycophantic “associates.” Of course, Duke—after setting you straight—would probably suggest a round of 18 holes at the local golf course and even pick up the greens fees just to show you what a stand-up guy he is. And serving as the smiling bandleader with just a hint of an Elvis sneer to his lip, Richie Ladner brings decades of professional experience to the table, having been a latter-day member of New Orleans’ legendary Jokers. Playing with an almost pornographic joy, he is both a stellar pianist and vocalist, and his baritony rendition of “Take Me Home, Country Roads” melded into a gospel medley still sends chills down my spine. When not amazing you with his melodiousness, Ladner will slay you with his hysterically ribald humor and impeccable comic timing. But New Orleans’ pull was too strong on Pennino, and he stayed put, carrying the torches of Jumbo and Butera and continuing to play with an otherworldly fire-and-brimstone ferocity, yet with utter lyricism and beauty on tour-de-force power ballads such as “Europa.” Pennino’s voice on saxophone is completely unique, but then so is his shamefully undershowcased singing. His vocal rendition of Dean Martin’s “Return to Me” is incredibly sensuous, and his Elvis interpretations must have the King himself sitting up in his crypt and taking notice. 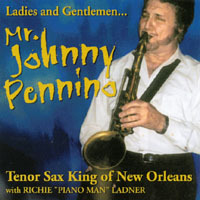 But Pennino ultimately is a horn player who makes anyone’s band sound better, as evidenced by swamp-pop legend Johnnie Allan turning to me one night at a West Bank hideaway and asking in bewilderment: “WHO IS THAT GUY?” The Cajun icon was simply blown away by Pennino, who had just accompanied Allan on his own set—walking on totally unrehearsed and never having before met. Injecting some intangible Mo-jo to the mix was John Dauenhauer on baritone sax, who is always a welcome sight wielding that bazooka-like piece of brass, which was key to the classic 1950s riffing ensemble horn sound, but which is rarely employed today—and sadly so. The titanic instrument’s notes are almost imperceptibly heard at first—hitting your gut and injecting a fat-bottomed groove to the wailing sound of the tenor above it. Thanks to Our Lady of Prompt Succor for the presence of John Dauenhauer on bari sax. He’s like a flambeaux carrier in a Mardi Gras parade: Just when you thought the tradition had died out, there he is with his big flame-throwing rig, bringing it all back home again. Drummer Wally Rabalais is another unsung local veteran, having set a splendidly percussive tone with countless bands and frontmen like Bobby Lonero; Al Dressel and the Fugowees; and Midnight Streetcar. Rabalais is a rock-solid timekeeper but also surprises audiences with his own singing voice. For one second at Mo’s I thought Clarence “Frogman” Henry was in the house, exclaiming out of nowhere that he sang like a frog and had no home. Turns out it was Rabalais doing his dead-on Frogman impression from behind the drum kit. The legendary Frogman was hopefully enjoying some well-deserved relaxation on his front porch in Algiers, content to let his disciples do the singing.